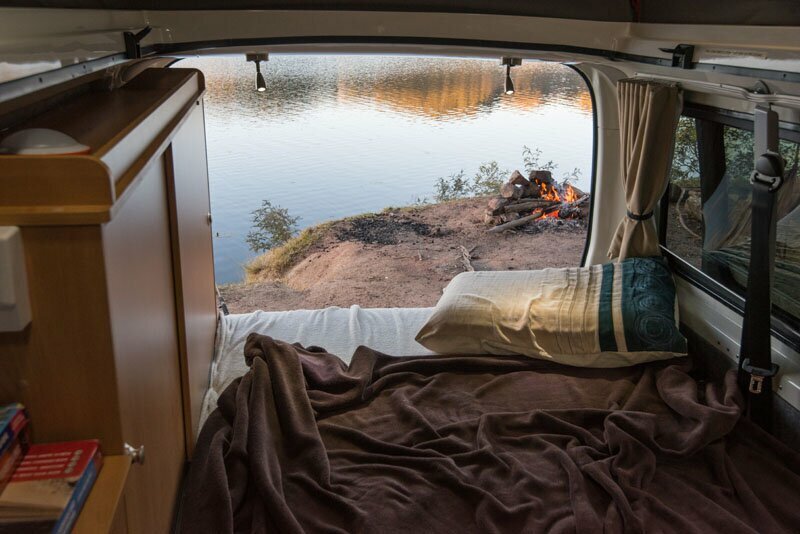 Unbiased campervan review - Frontline Hiace Adventurer - awesome pics! Started 30 years ago now, Fronline Campers has built a solid reputation for simplicity and reliability. 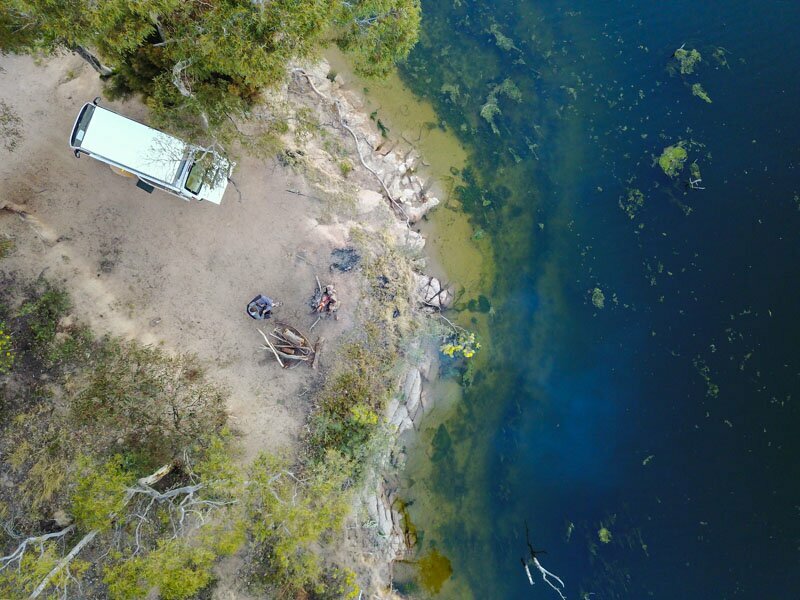 Founded by a young Peter Farugia, who’d been building campers for another well known Sydney brand, and Jeff Verhagen, the pair’s first conversion was of the venerable Toyota Hiace. It would be two or three years before they even considered a Volkswagen. And after 30 years, Farugia’s Frontline has hit the nail on the head when building simple, no-fuss whizz bangs. 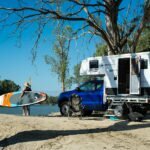 The Hiace Adventurer is the epitome of that – not because it’s the best van on the market (it’s not – that’d be a tight pick between Frontline’s VW version, and another Sydney builder’s equivalent – but that’s an argument for another time), but because it represents the best value for money campervanning in Australia, right now. The Toyota van that this is built in is adequate in every way, without being excellent at much – but that’s very typical of Toyota. Best of all, though, the Hiace nearly feels like a real car to drive, and far less like a small bus. The steering wheel and seating position mimic a car’s, so you don’t sit over the steering wheel, as it where, and even though you’re right over the front wheels, it isn’t rough or harsh. The 2.7-litre four-cylinder petrol engine doesn’t work hard except on long climbs and the automatic transmission is quite good. Being right over the engine, there is quite a lot of noise from it, though, so it can seem a little commercial at times. We eagerly wait for Toyota to release a front-engine Hiace for that reason, and to hopefully gain a walk-through cabin. Fuel economy is quite reasonable, though – I average 10.3L/100km on my test. The Hiace isn’t perfect, though – there’s no ability to walk-through from the driver’s cabin, and safety isn’t as high in this as compared to the VW. It’s the conversion that makes the van, though, and that’s where this thing shines. 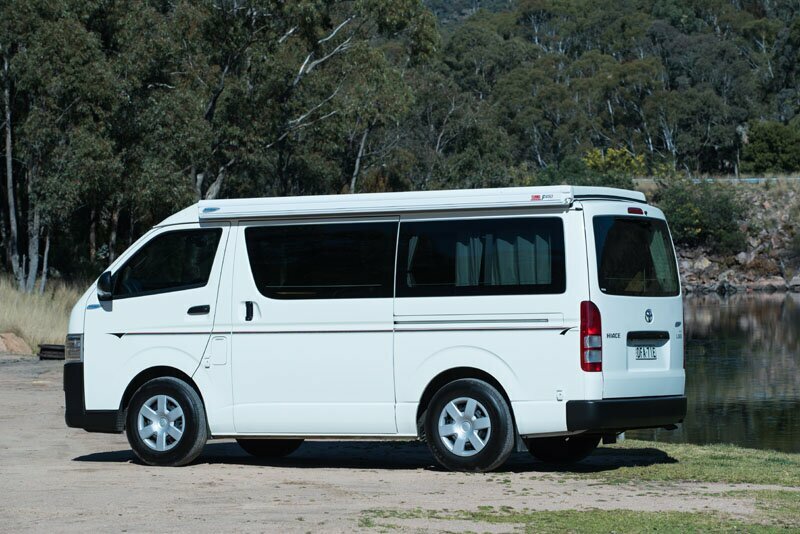 There are five layout options in the Hiace range, although the Adventurer I’m testing is clearly the most versatile, and unsurprisingly, the most popular. With a bench seat in the back, there is seating for up to four people, which makes it great as a daily driver – even for people with small families, and offers lounge-like seating when it’s in camping mode. The seatbelt assembly has even been pull-tested, to ensure it’s up to the task. 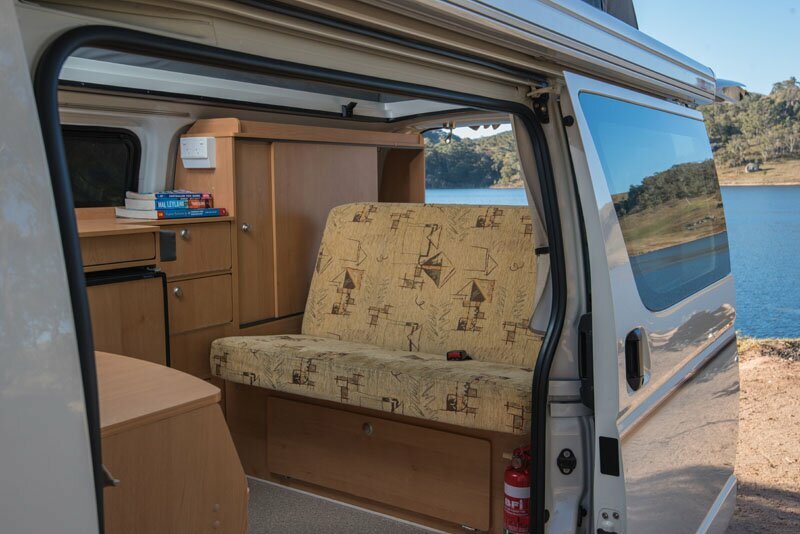 Folded down – the lounge flattens into the van’s double bed. Without any fancy upholstery or contours for looks, the bed is comfortable without any needless lumps and bumps. And as half of it always stays in place, the bedding can easily be folded onto the permanent half when not needed, and folded back out when it is. There’s plenty of storage underneath, too, with access made easy through the rear tailgate, or a large hatch under the bench seat. Keeping things simple, there are no gas appliances in the kitchen. The fridge is an upright 12/240V 80-litre Engel and Frontline has been fitting them as long as I can remember. When cycling, the fridge can seem a little noisy, but is otherwise efficient and keeps food cold reliably. The stove-top is a Dometic two-burner metho stove, which despite seeming primitive, is one of my favourite camping stoves (apart from the one in my 1981 Viscount, which is the best I’ve ever come across). The flame is almost infinitely adjustable with roughly 7000BTUs per burner (by comparison, a Weber Baby Q produces just 8500 BTU). Not only that, the metho stoves are half the price of gas equivalents, and there’s not need for gas plumbing or compliance, so it brings the price of the camper down. The stove is set in a swing-out cabinet, hinged at the sliding door. It can be used inside the van or swung out for outside cooking. It can even be removed completely and set up anywhere in camp, if the need arises. The cabinet has two shelves intended for pots and pans and other cooking essentials. The rest of the kitchen features a stainless steel sink, large pantry cupboard and three smaller cabinets. There’s also a shallow (in height) but deep (in length) cutlery drawer above the fridge. Cleverly, all of the storage areas can be accessed no matter the camper’s bed configuration. A 12V pump gets cold water to the sink, although to get it hot you need to transfer it to a kettle first. 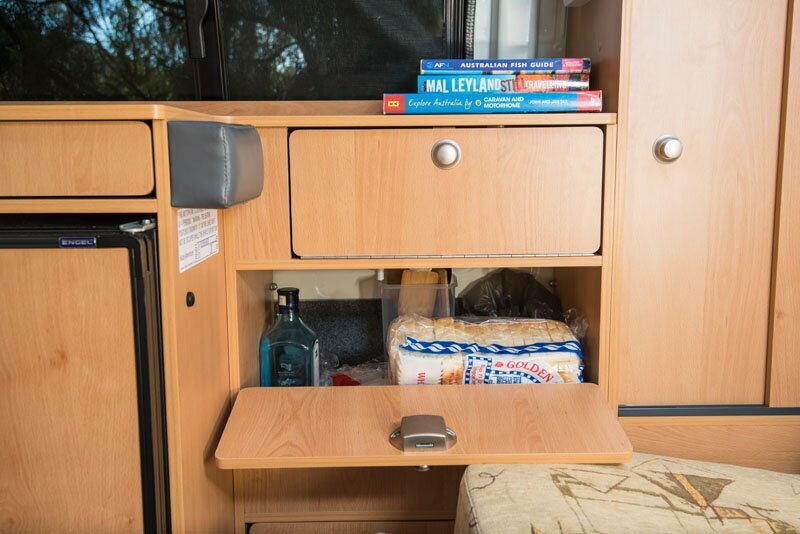 Considering a diesel, gas or electric hot-water heater is rather larger and intrusive, the kettle is the best option in this small camper. The only other major piece of cabinetry worthy of note is the large storage cupboard to the rear. With double sliding doors it’s divided into hanging space and shelves – a simple and effective space. Typical of all Frontline woodwork, the conversion feels solid and doesn’t make much noise. This one I’m testing has been on Frontline’s fleet for about a year, so has 40,000km under its belt. Even so, there’s only one small squeak from the kitchen cabinetry and barely even a rattle from the cooking gear I haphazardly threw in for my trip away. Considering I’ve tested far newer, far more expensive motorhomes and campers that squeak and rattle like an old box trailer, that’s more than impressive. In the electrical department, the Frontine Hiace is modest, although given the load is light, that suits it well. A single 100ah house battery powers the two main LED lights and three reading lights through the van. Along with the 12V pump, fridge, two 12V outlets and a USB charging point, Frontline says it’ll easily last two nights at camp without needing a charge. 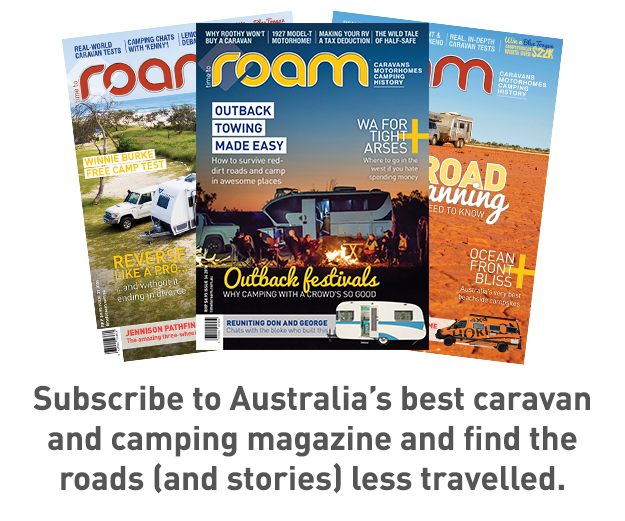 Given the nature of campervan travel, that’s plenty of capacity. A small 12V monitor in the kitchen helps keep tabs of it all, though, just in case. More batteries and even solar panels are easily added. 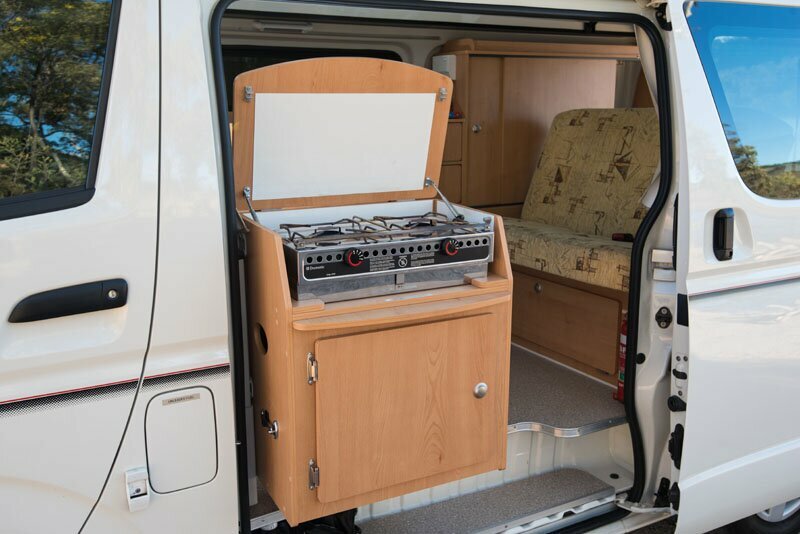 But before we finish, I want to point out the one feature of the Frontline product that I wish every pop-top caravan/RV/campervan/motorhome manufacturer would take on board – the clamps for the pop-top are inside the van. It means that in inclement weather, you don’t need to get out to pop the roof. If the van were higher (like and off-road caravan, for instance), there would be no need for a small ladder to open the roof. It just makes sense to me. 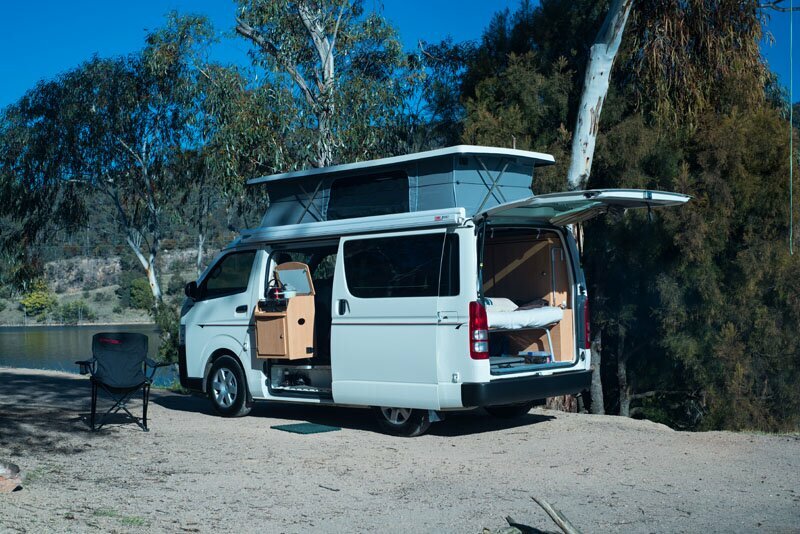 Overall, the Frontline Hiace Adventurer is a clever and easy to use campervan. It’s comfortable where it needs to be comfortable and strong where it needs to be strong. It doesn’t have the grace of some other examples, but at the same time, you’re not paying for grace. If I were after a campervan, I’d be hard pressed convincing myself I needed to spend more, after testing this.